How do you take care of others? How do you allow others to care for you? 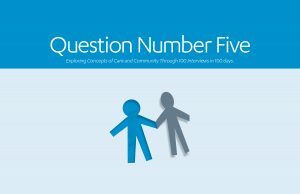 After answering the questions and not being satisfied with my own responses, I decided that I would interview 100 people, one each day for 100 days, and ask everyone these same five questions. This took place from May 14 to August 20, 2015. The project began as a challenge but about a month in, I stopped viewing it this way and embraced it as an opportunity. In the beginning, I would aim to do more than one interview each day because I was afraid that I might not meet someone the next day. Letting the motions of my environment guide me instead of trying too hard to control them gave a new freedom to the project and made for better interviews. There is no shortage of people on the street in Washington, DC or the cities I travelled to in the 100 days—New York City, Chicago, Baltimore, Los Angeles—and I waited until I felt drawn to talk to someone in passing and then walked up to him or her to discuss this project and asked them whether we could do an interview. There were a couple people who needed some convincing, like David Letterman, who was with his lawyer, and there were a few people who declined the opportunity altogether. But most agreed to be interviewed and they matched my interest and enthusiasm for the project which their answers reflect. By about the halfway point, the focus of the project shifted from my own discovery and learning to taking part in a relational experience with a larger community. It felt as if my chance meetings were somehow a re-connecting with old acquaintances rather than that of two strangers meeting for the first time on the subway, n a shop, or walking down the street. The community I felt I was building may have been a reflection of a void in my own life or it may have been legitimate in its own right. I wasn’t sure, but as the project took on a larger part of my life I was enjoying hearing people’s thoughts on the subject of ‘care’ and the diverse responses they offered. I recalled that many people had trouble answering this question and a few could not even come up with a response. Turning my attention to question five, I realized that everyone could have somewhat of a stock answer for questions one through four but not for five and therein lies a crucial discovery: The extent to which we allow others into our lives affects the degree to which we participate in a community. Doesn’t sound like much of a discovery, right? But think about it…how often do we render ourselves unable to accept another’s presence as having meaning, acknowledge the questions it may force us to ask ourselves and be reminded of the fact that we are ‘social beings’? Through this communal interaction, we may see our deficiencies and proficiencies more clearly. 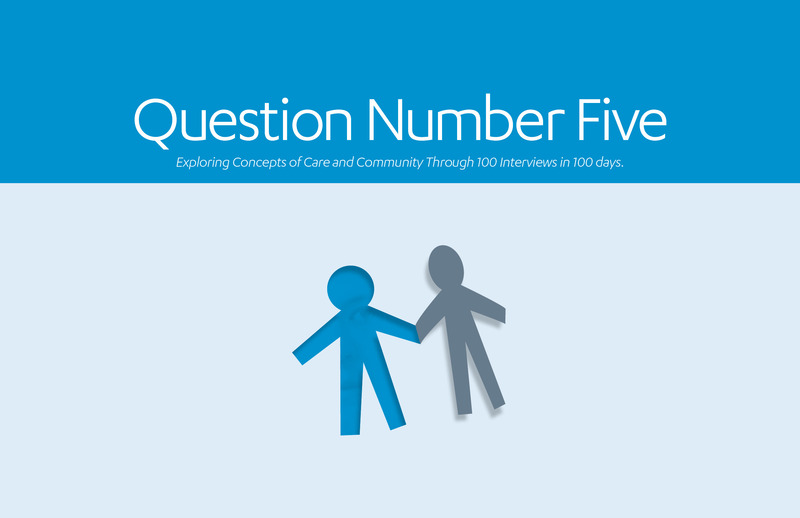 Many of those interviewed hit upon the fact that participation in community in such a way requires being vulnerable. It may require accepting ourselves for who we are and not over-projecting our expectations of others onto them. When we feel we have all that we need—wealth, title, looks or love—it can be easy to allow these things to be more than they are, blinding us to needs we have that we cannot buy, brag about or smile for. But it is these latter things that one arrives at through engaging with and committing one’s self to being part of a community, a gang, a group, a congregation…a movement. My hope is that the answers you read will not provide a sense of finality but a stepping stone to your own discovery of what it means to care, the role you play in caring for yourself and others, and ultimately, the areas you could stand to explore and expand through participating in a community, allowing others to care for you in ways you cannot and need not, on your own.